"A moist not too sweet version of a figgy pudding but made with dates and minus the spices. You could try covering with buttered foil and steaming it for a even moister version. This can also be baked in a (28 ounce) can." Preheat the oven to 350 degrees F (175 degrees F). Grease and flour a 9x5 inch loaf pan. In a medium bowl, combine the dates and butter. Pour boiling water over them, and let stand until cool. When the dates have cooled, stir the mixture to break up any clumps. Mix in the brown sugar and egg until well blended. Combine the flour, baking soda, baking powder, and salt; stir into the date mixture until just blended. Stir in walnuts. Pour into the prepared pan. Bake for 50 minutes in the preheated oven, or until a wooden pick inserted into the center comes out clean. See how to bake individual mini-loaves of banana bread in canning jars. Excellent! Added 1 tsp cinnamon and completely forgot to add nuts, but it was lovely nevertheless. Only change I would make next time is to reduce the amount of sugar, maybe to 1/3 cup. 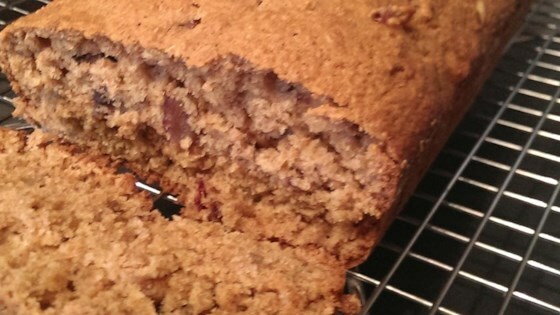 A delicious, moist date bread just like grandma's! Very, very good. I made this for my husband to take to work, and he said everyone devoured it. Thanks for a good recipe. Excellent moist flavorful. I didn't steam it but I wrapped it in foil while still hot from oven. It stayed moist for 3/4 days and I could slice it quite thin with ease.